Mathieu Matégot ( April 4th, 1910 - February 2001) was a creative and material Hungarian / French artist. He was one of the most famous French designers of the 1950s. Matégot was born April 4, 1910 to Tápió-Sully, a village located about 20 km (12 mi) from Budapest, Hungary. He studied at the school of fine arts and architecture in Budapest between 1925 and 1929. He created sets for the National Theatre. He then went to Italy and the United States before settling in France in 1931. He took jobs including Make sets for the Folies Bergeres, Galeries Lafayette displays, women dresses design and at the end of 1930, creating tapestries. In 1933 he began to create his first examples of rattan furniture mounted on metal frames. After the war, Matégot created a handcrafted furniture making workshop using a variety of materials such as metal, rattan, glass, Formica, and perforated sheet. The workshop made chairs, tables, sideboards, tables and other objects he designed. Initially based in Paris, the workshop then moved to Casablanca. Matégot designed the chair three "Nagasaki" legs in 1954 and the chair "Copacabana" (1955/1956), both of tubular steel and perforated sheet materials whose characteristics pioneer Matégot use. President Nagasaki is currently held in the design collection of the Museum of Decorative Arts, Paris. Copacabana is the chair in the design collection of the Centre Georges Pompidou, Beaubourg, Paris. 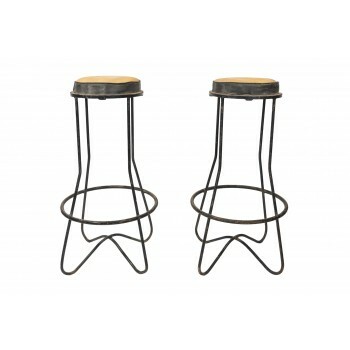 Mathieu Matégot, Pair of stools, Iron and skaï, France, circa 1970. Similar model: Patrick Favardin, Norma Edition, in situ page 25 of the pictures. Measures: Height 82 cm, diameter 43 cm.